Tim & Nick, die Chefs von STEREOSCREEN haben sich im Sommer 2010 mit ihren zwei Kameras, ein paar Objektiven und einem Stativ im Kofferraum auf den Weg zum Nürburgring gemacht. Der Masterplan: Atmosphäre, Spannung und die unglaubliche Herausforderung für Teams und Fahrer während der "24 Stunden" einfangen. Zurück im Headquarter arbeiteten sie mit Hochdruck am Schnitt, der Farbbearbeitung, dem Sounddesign und dem Artwork, während Karsten die getrackten Grafiken bastelte. 96 Stunden nach dem Zieleinlauf war der Film online. Was als Herzensangelegenheit nur zu unserem eigenen Vergnügen geplant war, wurde zum internationalen Erfolg. Über 250.000 views auf Tims privatem Vimeo Account. Dazu Credits aus aller Welt. Der Film sprach für sich selbst. Die Jungs von BBC Top Gear titelten: "The next 13 minutes of your life will be very enjoyable indeed..."
Back in summer 2010 Tim & Nick, the CEO's of STEREOSCREEN, traveled to the Nürburgring with their two cameras, a few lenses and a tripod on the backseat. 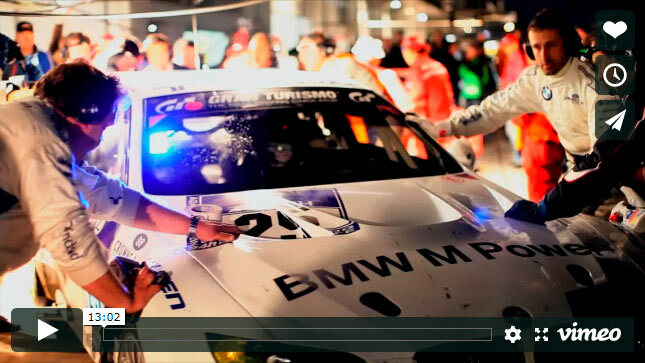 The intention was to capture the atmosphere, the tension and the incredible challenge for teams and drivers during the "24hours". Back in the studio they did all the editing, sound design, color correction and artwork, while Karsten was working on the tracked graphics. 96 hours after the chequered flag dropped, the film was online. What was planned as a project just for our own pleasure became an international success. More than 250.000 Views on Tim's private vimeo account and credits from all over the world speak for themselves. The guys from BBC Top Gear titled: "The next 13 minutes of your life will be very enjoyable indeed..."